Rustbelt Artists Summer Market Youngstown Riverfest - Carmichael Inc. Enjoy a Day by the River with the Rustbelt Artists Summer Market Youngstown Riverfest Activities. Carmichael will be at the B&O Station Rustbelt Artists Summer Market Youngstown Riverfest again this year (2016) on Saturday June 4 and Sunday June 5. 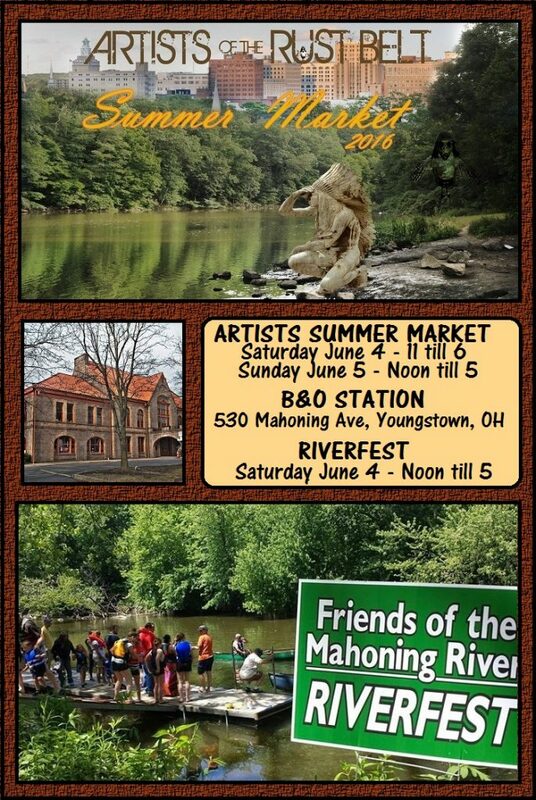 The Friends of the Mahoning River will be hosting their 5th annual Riverfest on Saturday June 4. The seventh annual Artists of the Rust Belt Summer Market features local artists offering photography, jewelry, ceramics, sculpture, pottery, painting, drawing, mixed media, fiber, apparel and beauty products. In addition to art merchants, there will be live performances and demonstrations. The Friends of the Mahoning River will host the fifth annual Riverfest, a free, family oriented event celebrating the Mahoning River. Learn about the value of the River, take a scenic walk along a nature trail, and Trumbull Canoe Trails Club will take visitors on a canoe or kayak ride to see the beauty of our natural water resource. Environmental exhibitors bring their knowledge of the environment to all who attend.